Netflix's heavily marketed and anticipated original series Luke Cage, based on the popular Marvel Comics character, debuted Friday September 30th, and assumed command of both Netflix viewership and social media. Almost two months ago, we posted a trailer for the series to the Imajen.com facebook page, in a good faith gesture in support of what we hoped would be a show that could impact culture...and in our estimation it has, overall. Our review is leveraged with knowledge of the character as he exists in the comic book universe, story adaptation for contemporary viewership, and cultural relevance/impact. Initially, when the first press releases hit the web, announcing Mike Colter as the selection for the starring role, we were not sold. 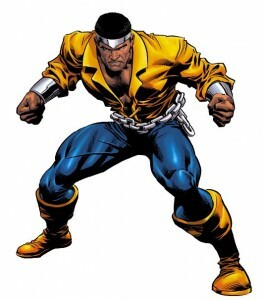 Being purists, we thought that Luke Cage should resemble the original version of the character, but after that initial reaction subsided(upon considering his ridiculous original costume), we held an open mind towards a basis on the updated version, as long as the essence of the character remained the same. To that end, we give Mike Colter, mixed reviews. 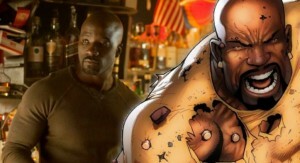 Physically, Mike Colter does fit with the revised version of the character; shaved head, furrowed brow, muscular build, goatee. Performance-wise, he does a fine job carrying the role, delivering his lines believably and filling out the character to make him personable, relatable, and real. That is, with the exception of the rage. For Luke Cage, aka Power Man, rage is about as central to the character, as it is with another Marvel character, The Hulk. In this aspect, Mike Colter comes up a bit short. Characterized in comics by his impenetrable skin, superhuman strength, and smoldering disposition, Luke Cage exudes strength, power, and anger. In the show, however, other characters allude to it, and you see him wreck things (or people), but as a viewer, you just don't "feel" the rage. The destruction comes across Terminator-like. Absent of any emotion. The supporting cast boasts a number of top notch actors, such as Alfre Woodard, Mahershala Ali, Simone Missick, Rosario Dawson, Frank Whaley, Frankie Faison, Ron Cephas Jones, Erik LaRay Harvey, and Theo Rossi, among others. Each one adding layers of depth and complexity to the developing characters and storyline as they evolve across the 13 episode timeline of Season 1. 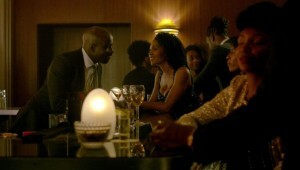 One particular supporting character, that affects every scene just as much as Luke Cage himself, is Harlem. It reflected and revered in the attitudes, the vibe, the backdrop, and the dialogue....with the last being both figurative and literal. In keeping with the level of acting, the production value of Luke Cage is top notch. 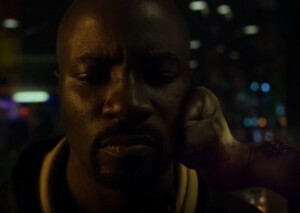 Lighting, audio, sound track....all working together in unison, seamlessly, and invisibly, contributing to the unique look and feel of the universe in which Luke Cage exists. The story line, which arcs across 13 episodes, flows rather well across the first 5-6 episodes. While overall, the show is quite entertaining, there are a number of episodes perhaps episodes 8-10 or 11, that seem to drag along a bit. I understand that in those episodes there were particular issues and dilemmas that Luke had to overcome, but that portion of the series seemed more like filler than conflict resolution. Visually, it was uniquely empowering, experiencing the Luke Cage universe, represented by a predominantly black cast, along with other people of color. Though of course, across social media, there have been whites complaining that depict such a universe(translation:without whites as the center point of the story) is reverse racism. -Say what now? That universe didn't appear artificially lacking of white people to me. -A Harlem populated predominantly by blacks and other people of color seems perfectly authentic to me....unlike the numerous ridiculous depictions of Egyptian culture predominantly featuring whites as Egyptians. Additionally, the depiction of Luke Cage, the embodiment of a black man, strong in body, mind, and character, fighting the good fight, and pushing through the economic and cultural struggles....ever emerging, unbroken and unbreakable...that alone merits support of the show. Interestingly enough, it is the strong character and principles of Luke Cage on the show that has blacks across social media criticizing him for "conservatism". With the most specific knock against him apparently being because he does not use the n-word, nor does he allow others to refer to him by it. Though I haven't heard anyone positively mention his aversion to using firearms, or his continual discouragement of others intent to use them. Come on, let's just call the conservatism criticism what it really is....."crabs in a barrel" ignorance. We(black folks) can't on one hand complain about negative depictions of us by others, and then turn around and expect to be portrayed that way. That too is ridiculous. Not to mention schizophrenic. If anything, I would have expected the eye and neck rolling to concern the "typical" depiction of darker skinned black women characters in the series. With one exception, there aren't any "normal" black women in the series. All of the women as depicted are either, ghetto, emotionally detached, emotionally defective, liars, shady, and/or have violent tendencies. The one exception appears briefly in the beginning of the series, and reappears briefly towards the end. Hint: Beautiful dark skinned single mother. While we're on the subject of ridiculous....the other topic being floated around black social media is that of Mike Colter being married to a white woman. Firstly and lastly, Mike Colter is the actor, portraying a fictional character. What he does in his personal life is none of anyone's business aside from him and whomever he is handling said business with. Personally I think that most people spouting that nonsense are probably not followers of the comics. For those that don't know, Luke Cage was married to a white woman(Jessica Jones) in the comic book story line, and in fact they had a child together. So if anything, I'd say that might give Colter a unique insight into the character that perhaps an actor married to a black woman might not have. (In case you missed it, that last line was sarcasm). In the end, Luke Cage is worth the investment of the 13 hours or so needed to power through the season. -Have we said how much we dig the way Netflix releases all the episodes at once for their series'? All things considered, we rate the series, and it's unapologetically black characters at 8.75 out of 10, equivalent to an A-. There are some shortcomings and criticisms, but given this is the first season, and a bold new offering, we are optimistically allowing for time and room to correct as the series progresses. 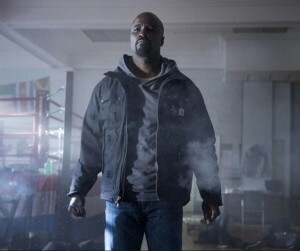 Given the success of the first season, particularly how the feverish demand to watch during the first weekend literally shut down Netflix's streaming services for several hours, there is no doubt that there will be more Luke Cage forthcoming.